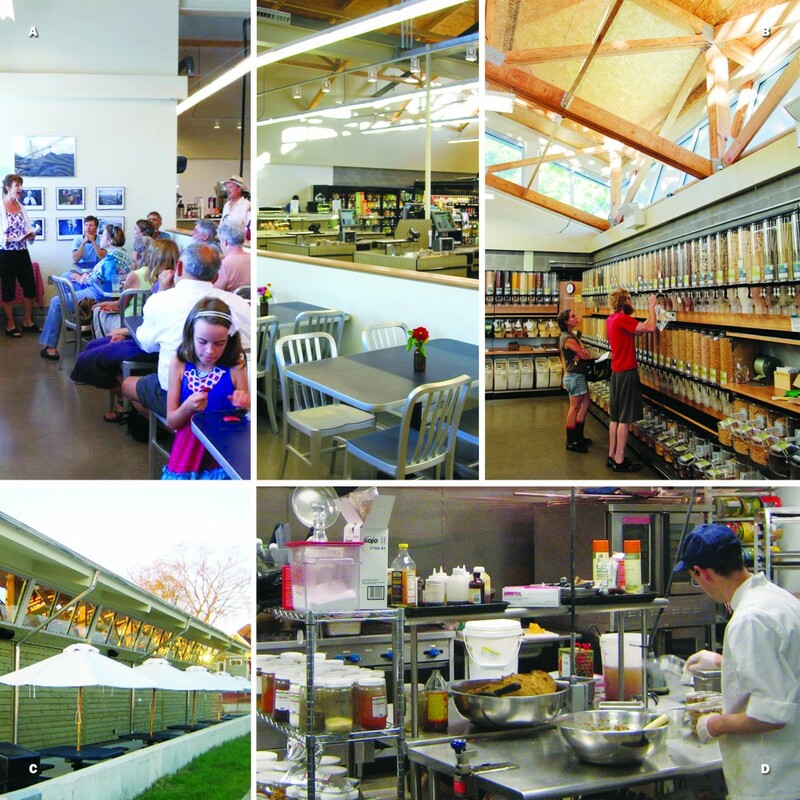 Serving the local organic food market from a 2,500sf house-turned-commercial-space near downtown Knoxville, Three Rivers Market (a community food co-op) built the first facility in their 30-year history to serve their growing member base. TRM Mission Statement: A cooperative center of sustainable commerce, TRM exists to benefit its members by creating and nourishing a healthier community, healthier people, and a healthier environment. 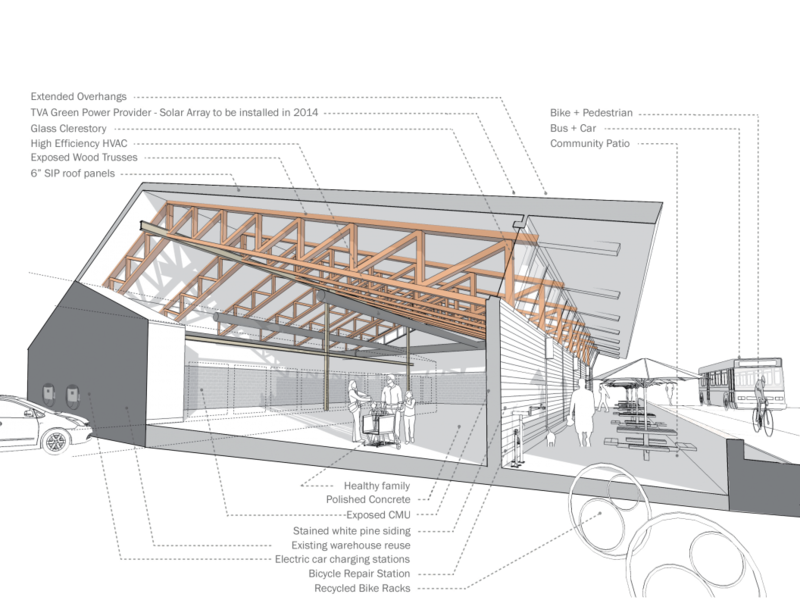 By designing a building that supports and enhances their mission, TRM is able to not only operate sustainably, but also to promote and educate the community about their cooperative principles. There is a common perception that cities contain less than 10% Architecture; referring to prestigious structures which have high cultural or sustainable value. The rest are just Buildings. That would imply Architecture is only for special occasions. However, a 2006 monograph titled: Architecture isn’t just for special occasions, suggests that places for daily activities should also be highly valued, and if we expect great qualities in Architecture, shouldn’t we also expect them in our everyday buildings? We challenged ourselves to support this position by translating TRM’s cooperative and sustainable principles into Architecture for any occasion. The focus was about creating an everyday Building that doesn’t do less than it needs to, but doesn’t do more than it can afford to. But, for a business that has survived in the same location since 1981, a primary design goal was how to blend very real growing pains with the same sense of belonging people have been enjoying the past 30 years. To succeed required taking into account the community, the people and the environment as part of the design process. Ultimately, nourishing healthier people is about creating a unique place where they feel welcomed, where they can add their own mark, and where they feel pride as a part of their community. In a sense, everyone shines in a way they couldn’t before. 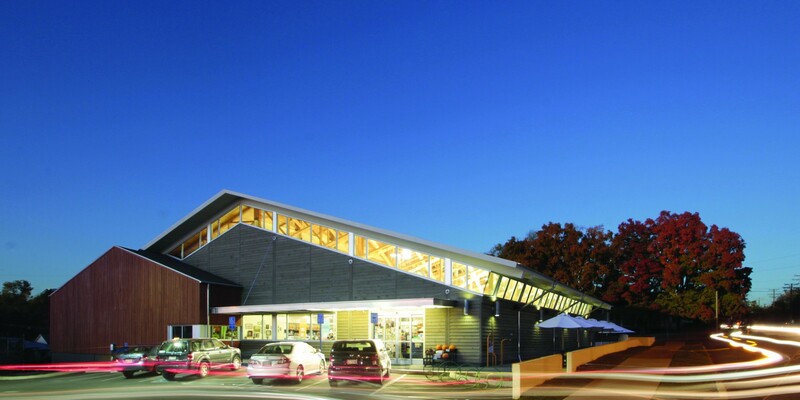 The outcome: Their new building has a character that is unmistakably Three Rivers Market. First, TRM believes a healthier community exists through a strong and humane local economy. 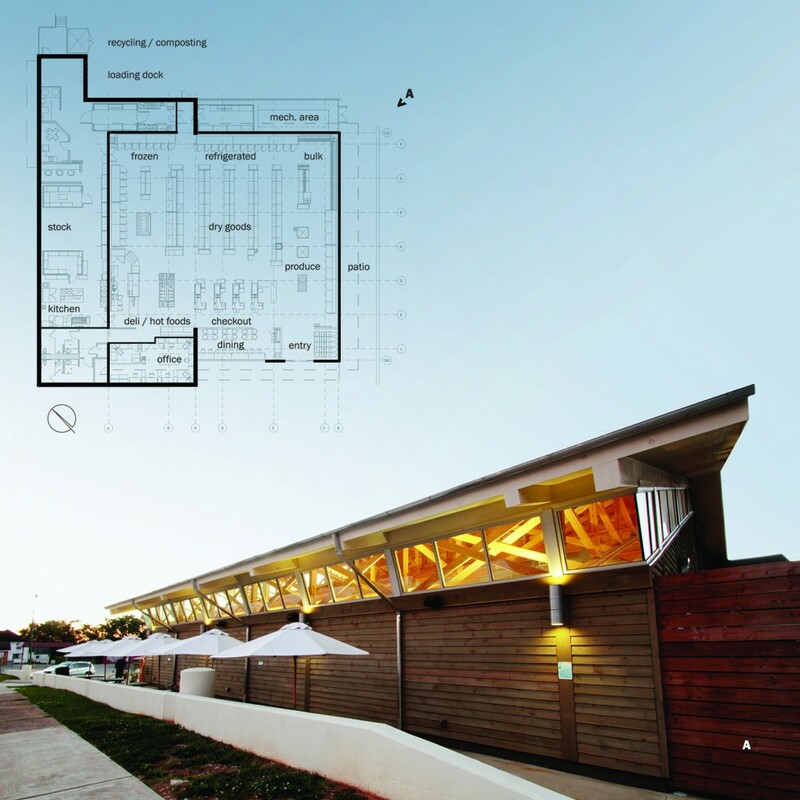 Architecturally, this meant looking beyond basic zoning requirements and expanding our scope to see how TRM responded to its place in the community. The site is positioned within a ½ mile of many basic services and facilities, allowing customers to shop and live within the local district. Food Desert: TRM is located in an area loosely defined as a ‘food desert’, referring to the shift of large food retailers away from urban areas. TRM took advantage of their presence in the community, providing improved access and outreach to a larger group of patrons and vendors. Bus – there is a dedicated bus stop at the corner of the site, and with a purchase of $10 or more customers are offered a free bus ticket. 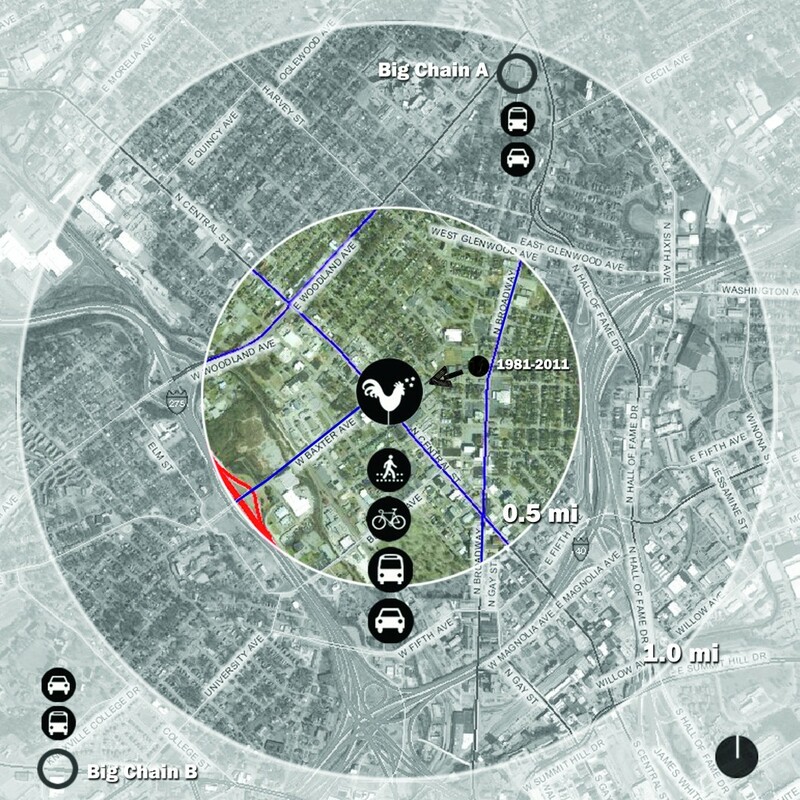 Occupying a prominent place in this community will allow TRM to become a key component of the area’s economic growth and recognizable image of the area. 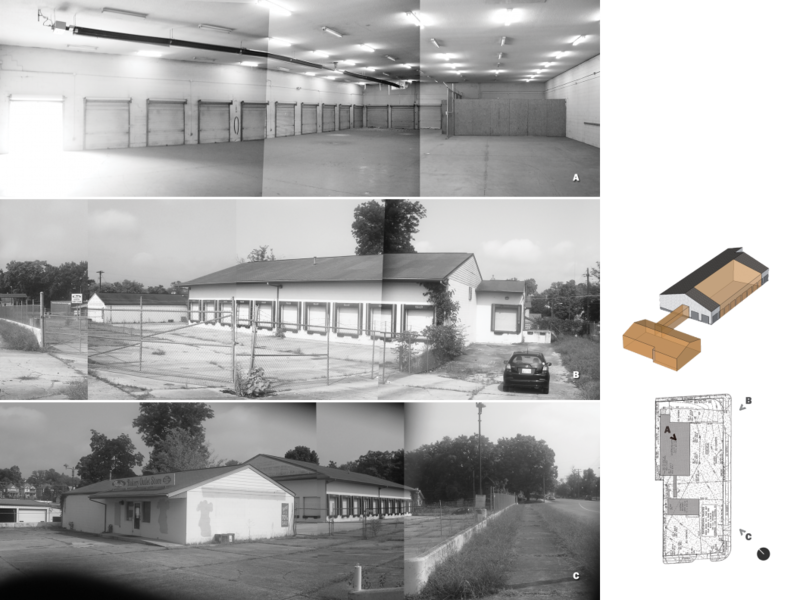 The relocation to this blighted property stemmed from TRM’s priorities to stay in the local community, incorporate the existing warehouse into the new design, and take advantage of city support as part of a larger revitalization plan. We developed an organization which promoted ease of access to the site and building (the separation of vehicular, pedestrian and service traffic), that welcomed the inclusion of the new (expanded amenities), and defined a sense of place unique to the TRM brand (the familiarity of home). The result is that this new building has expanded the potential for social connections by carefully arranging access, views and services. The first priority was to reuse as much of the existing building floor, walls and roof as possible without disturbing the character of the site. By covering the facades of the existing warehouse and new addition with stained wood siding (oriented vertically and horizontally to visually separate the old from the new), we were able to enhance the building’s unique character. The new mass mimics the shape and scale of the old, and the “ghost” of the original building is still visible both inside and out; a nod to the history of the site. A natural landscaping plan for water quality, aesthetics, and promotion of certain plants was implemented in the spring of 2013. It features native and edible plants, pollinator gardens, a demonstration herb garden, and bio-treatment depressions for storm-water as well as water catchment. Annuals will continue to be replanted each spring. This is the key element of Three Rivers Market’s vision. 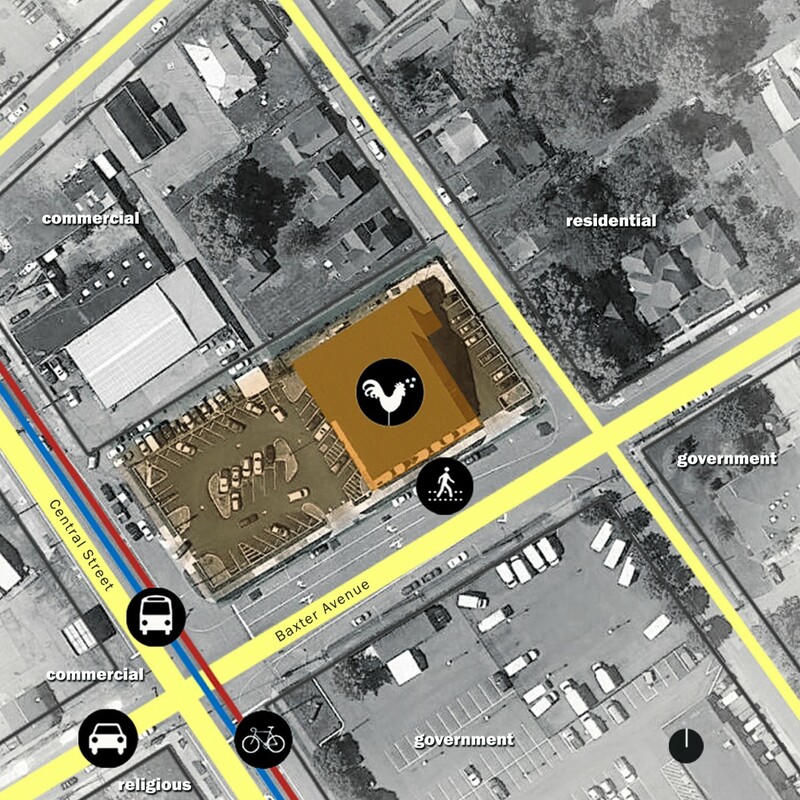 Their construction and relocation plan was to transform an abandoned bread warehouse with no green space into a vibrant, cooperative center of sustainable commerce. Next, TRM believes healthier people have access to the food and resources to make healthy choices. Ultimately, nourishing healthier people is about creating a unique place where they feel welcomed, where they can add their own mark, and where they feel pride as a part of their community. In a sense, everyone shines in a way they couldn’t before. Inside, the ribbon windows provide generous natural light. 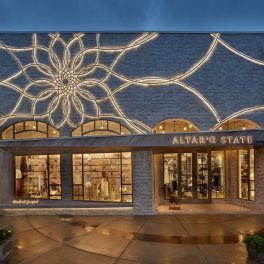 All of the energy-efficient lighting for the sales floor and exterior is controlled by a programmable system, and all support spaces have occupancy sensors to reduce power consumption. Coolers contain LED lighting, while the energy-efficient refrigeration systems utilize heat capture features. Finally, the plumbing and mechanical systems were designed for optimal performance and conservation, increasing indoor air quality. A. 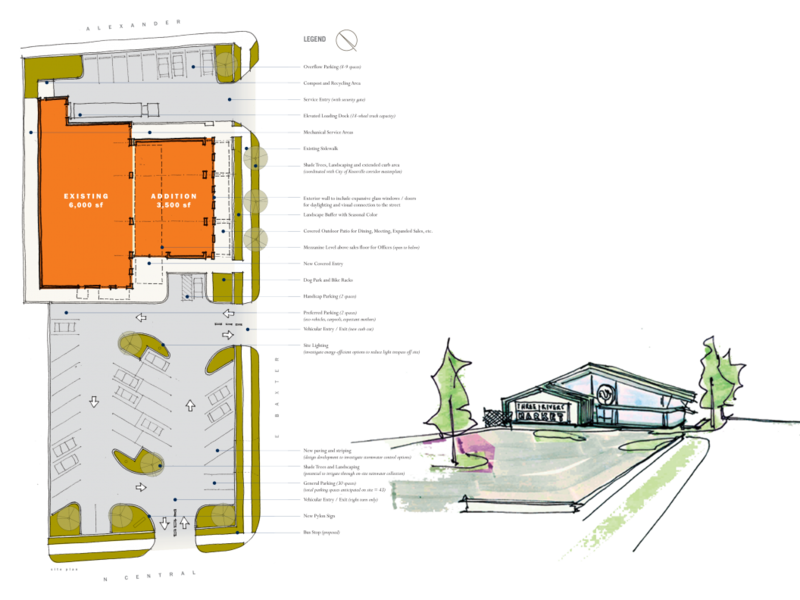 The plan includes a gathering area – what customers have affectionately called ‘the lunch room’ – used for daily lunch crowds, impromptu social meetings, and organized community events (including lectures and rotating exhibits). B. Customers are encouraged to purchase food in bulk, allowing for money savings and reduction of disposable packaging. C. A semi-covered outdoor patio with seating creates adjacency to the sidewalk, inviting increased social activity. D. Made from scratch food – prepared on site – along with local and regional groceries and products promote healthy eating. A dedicated recycling and composting area at the rear of the building is provided for employee and customer use. Finally, TRM believes a healthier environment includes protection of, and access to, the natural world. 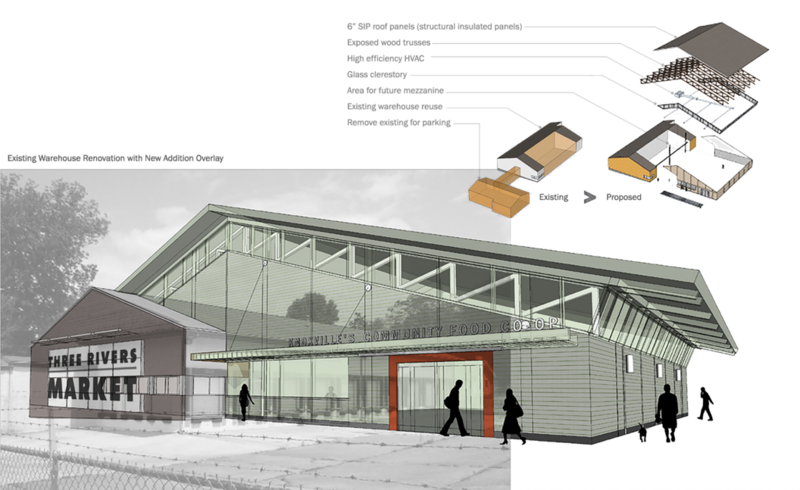 TRM provides its customers ease of access through generous sidewalks, bicycle racks, an on-site bike repair station, a bus stop and two electric vehicle charging stations. A deep front porch and side patio promotes interaction and expands the potential for social connections. The ‘barking lot’ (under the front canopy) includes pillows for dogs to take a rest and hydrate while their owners shop. Irrigation for landscaping was eliminated by using native plants, which require only average rainfall. Also, the EPA’s requirements for Stormwater Runoff were met to reduce pollution and contamination. TRM proudly participates in KUB’s Green Power program by purchasing multiple blocks of renewable energy each month. The signature element of the design is a ribbon of glass that separates the building’s new walls from its floating roof. The resulting ‘void’ lowers the sale of the building outside while inviting a playful dance of natural light inside. Wood trusses and SIP roof panels add warmth and intimacy in the large space. 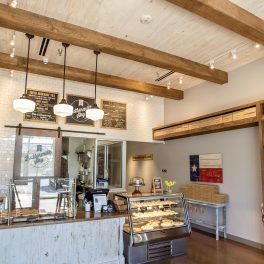 Like the exposed block walls that surround the sales floor, the structural wood trusses, and the stained wood siding on the exterior, all materials reflect a simple, honest approach to their function and use. 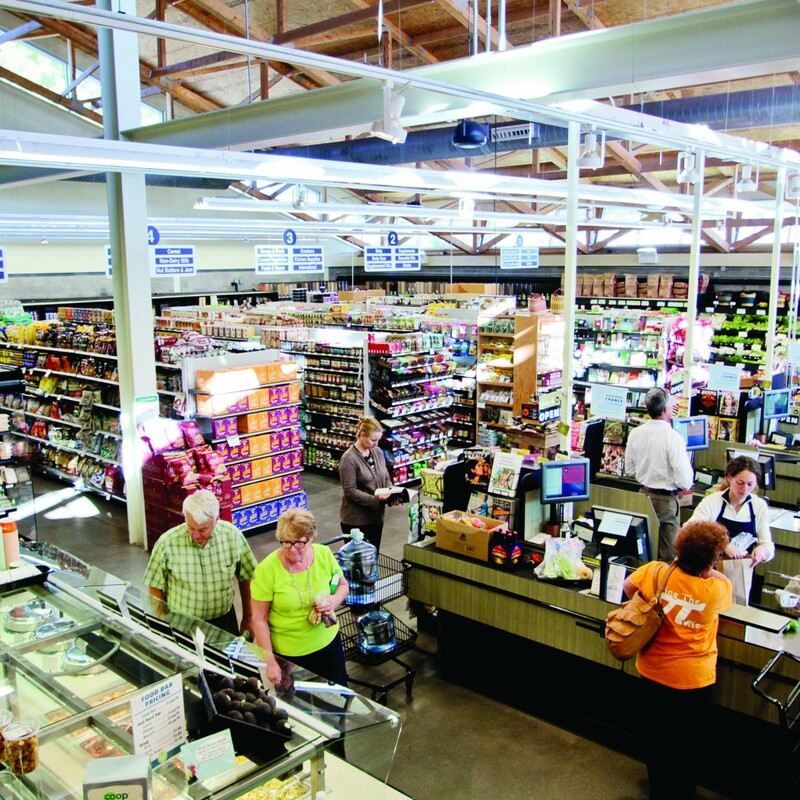 The building reflects the modern sensibilities and progressive attitudes of its patrons, and is unmistakably Three Rivers Market. The building has attracted a huge increase in both customers and owners. Over their first 30 years in business the co-op had less than 1,000 owners before moving to their new building. They now have over 7,000. The result: In the last 4 years, there has been a 700% increase in friends and neighbors who have purchased co-op memberships.